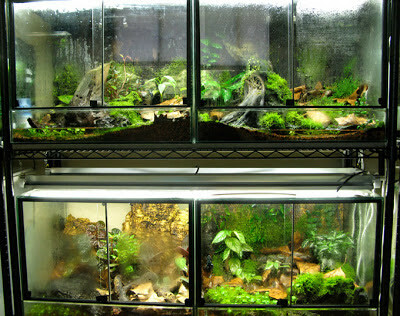 While perusing OrchidBoard I came across a link to Protean Terrarium Design, based in Portland, Oregon. The supplier builds custom terrariums, including many that fit into a grid design like the photo above from their customer gallery. While these terrariums appear most useful for vivariums that might contain wee creatures that need to be separated - wouldn't they make awesome side-by-sides of terrariums with different interior environments? Perchance a cacti set up, next to a high humidity environment, next to a more temperate forest type-terrarium. The possibilities seem endless.